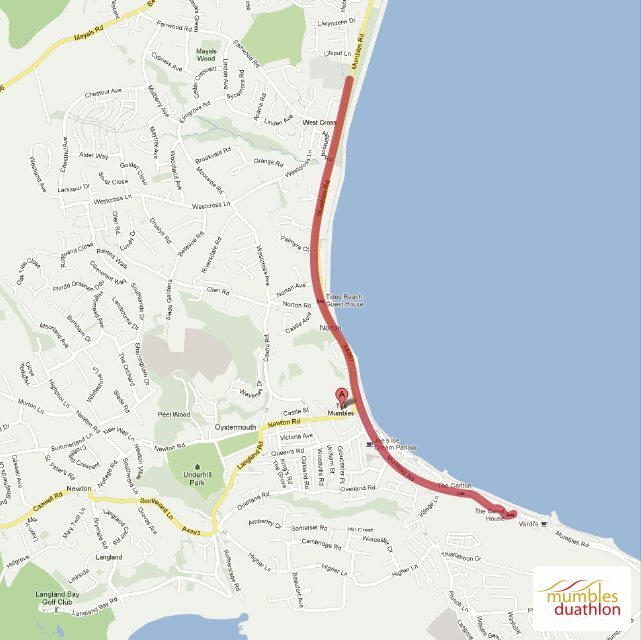 The Mumbles Duathlon will take place in Mumbles, Swansea. A great range of distances for athletes for all ability's and makes a great club event. This start of the season event is a great one to dust off the cobwebs. Starting down at Knabb rock for the first 5km run, then out on the Gower Peninsula for the 32k bike, followed by a 5k run across the mumbles road, taking in the beautiful scenery. Registration will be upstairs in the Mumbles Yacht Club. Minimum age should be 14 years for Sprint and Super Sprint. You will need your Photo ID and signed Disclaimer to be able to register on either day. Without these we have the right to stop you from competing Only you can register! You are not allowed to register someone else! Entries are non-transferable, so if someone else races under your details, you and the person racing will be disqualified and banned from all Activity Wales Events. At registration you will recieve an envelope which will include the following – 2 Bib Numbers, 1 Helmet Number, 1 Bike post number and 1 Timing Chip. Please make sure you complete the medical information on the back of your bibs. Both legs of the run route will take place on the waterfront footpath. Please keep to the left hand side of the promenade at all times and respect other path users. The first run for all athletes is 5km and will be one out and back route. The second leg of the route – for Long Distance will be 5k and for the Short Distance would be a 3k route. Both distances then finishing on the red carpet to receive your medal. 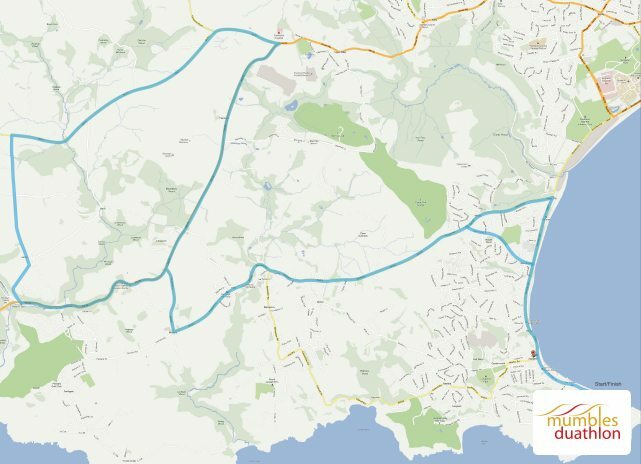 From Knab Rock, follow Mumbles Road to the 2nd roundabout and up Fairwood Road — on to B4436 and follow until St Marys Chiurch, Pennard and right on to B4436 and follow road. Take a Left onto A4118. Turn right up Lunnon hill and follow road and turn right on to B4271. Turn left back onto A4118 and then back onto the B4436 — right onto Mumbles Road. There’s loads going on at Mumbles Duathlon, so we’ve made things simple for you to work out where you need to be and when, simply check out our itinerary of events below. *Please be aware that this is a preliminary itinerary, and details of the event could possibly change closer to the event. Please note – Photographic ID will be required at registration. Athletes without this may not be registered by the start time of the event. Leave M4 at Junction 42 – the deceleration lane bends to the left sharply, so be careful! Join the A483 and follow it into Swansea; watch your speed (cameras). Immediately after crossing the river, turn left. You can join either lane. Follow the coast road all the way around the bay into Mumbles village. Drive past a mini children’s park on the left. Drive past The Pilot Pub on the right. Take the next left into Knab Rock car park. If you go up a steep hill with the pier down to the left, you’ve just missed us! There are public toilets at the start/finish line or at the Mumbles Yacht Club. The Mumbles Yacht Club will be open from 6am doing bacon rolls. Verdi’s will also be open from 10am. Do you have a waiting list for late entries? We do not have a waiting list as we already take into account expected cancellations when assigning a cap limit to our events. Once entry is closed, it’s closed. So book early to guarantee a place! Can somebody else register for me? No. For safety & security reasons you must register yourself and bring photo identification so that we can guarantee we are giving the right race number & timing chip to the correct athlete. I haven’t received my confirmation email/race pack? The Race pack can be downloaded from this link as of two weeks prior to the event. If you cannot find these emails, It is often the case that they end up in spam/deleted folders. If you have checked these folders – as well as any other email accounts you may have registered with – and still can’t find it, contact us using the contact form. These must be collected at the time of registration upon showing photo ID and a signed copy of the disclaimer. How do I find my race time? Tri and Enter are the official timing company for the event. The times will be listed later, on the day of the event. What is the prize structure? There are medals for everyone who crosses the finish line, including children who wish to run with their loved one! There are trophies for 1st, 2nd, & 3rd overall male & female. There will be a ceremony for 1st, 2nd & 3rd prize giving at the end of each event. Age category trophies will be posted out after the event. If 1st, 2nd, 3rd trophies are not collected at the prize giving, there is a 30 day collection period, where they can be collected from our Haverfordwest Office, or posted out at a cost of £5 shipping & handling. There are no road closures for this event. No, we discourage against anyone wearing headphones to race in. Yes, there is an overall cut-off of 11 am. This was my furst duathon, I signed up for a super sprint (5/21/3). The run is flat along the sea front. The bike has a few hills. The last leg of the run, same again down the sea front. The Sprint Race sets off at the same time. There were competitors around me pretty much all of the time. The traffic is the only negitive for racing in this area. Its a popular place. The race team has done a very good job posting signs on the road prior to the race, advertising cyclists on the road. Unfortunately the usual issues occur with traffic attempting to pass other cars that are giving road space to the cyclists. Registration was on friday night and saturday morning. They had a newbie brief friday night. It was very helpful and relaxed. Over all good event and a lovely area. Finishers medals, sweets, water and a free 5 minutes massge afterwards. Good for spectators, cafes at the finish line. And lots of porta loos. Ps- bring change for car parking. My first ever Duathlon. Like all of Activity Wales Events it was very well organised and great support but they are quite expensive. The medal was great but not giving a T-shirt is a bit stingy. The course was great and marshalling was good, luckily we had good weather. My only complaint on the bike course was the turn into Venaway Lane at Pennard. We had to turn right across live traffic and the Super Sprint bikes crossing our path at the same point. Having said all that, I will be returning next year. My first duathlon. Firstly, ive raced with Activity Wales Events before and the same quality of event organisation applied here. Registration was in the yacht club either on the Friday night or early Saturday morning. Plenty of parking but worth taking plenty of change for the car park as some take cards and others dont. The race and event itself is lovely with the bike heading out towards Fairwood common and back, in a loop. Finishing on the red carpet and having your name announced is a lovely touch. As always with an Activity Events Wales race it was very slick and well organised. This is a great event for those just starting out in multi sport or for those of us that have been beasting ourselves for a few years! Registration was pain free and the volunteers helpful. The run legs are out and back on the promenade and the bike is lumpy in parts with one nasty climb that necessitates the use of the granny gear. This was my 4th Mumbles Duathlon, and the best so far. A local race for me so know the roads and route very well. If you are not familiar with the area there is no need to worry as there are so many marshals out on the course it will be impossible to go wrong. The signage showing short and long course routes were visible long before you came near the split as they were so big! The setting is stunning and the bike course is a cracker. I would recommend either riding or driving around the course to familiarise yourself with it mainly so you remember where the cheeky little climbs are. Registration and beginners race briefings the evening before hand are brilliant, a few friends were first timers and found it a great help.The only thing that is important (and which is made clear in the briefing) is that Mumbles traffic can get busy as they day gets going, so you must take care as you leave and return.I'll definitely be doing it again next year. Being my first race I was very nervous and anxious.The brief we has the night before with Scott made me feel much more relaxed!Really enjoy the race day and would definitely do it again!Fantastic organisation and a big thanks to the Marshalls for cheering me on when I needed it most! This is was my 3rd year of taking part in the Mumbles Duathlon, and although I knew I wasn't going to be on fora PB this year due to my lack of training, the event didn't fail to impress.The guys at Activity Wales Events always put on a great show, from as early on as the registration, to the organisation of the event on the day.The course itself is a good mixture of nice flat running, and challenging undulating hills for the cycle, which certainly got the heart pumping!Overall, a great morning out, well organised, and fantastic for those who are new to multisport events. My first time at the Mumbles Duathlon but like all events run by Activity Wales Events, a very well organised race!I'm not one for too much running, much prefer the swim and bike but this has an option of a short and long distance, where the bike is a little bit longer and the second run a 5k instead of 3k run. Despite the added running, i took on the longer route. Given it's late March and South Wales, cold horrible weather is expected but the clouds cleared to reveal a lovely sunny spring day! Really easy registration in the Yacht club, no problem to park in the many car parks available and easy to find transition right next to the main road/car parks/yacht club. Nice flat 5k to start, lots of really amazing athletes taking part, as well as those doing their first events, so definitely something for everyone. 32k bike course, hilly in places and windy across the Gower moor but well marshalled, lots of safety put in place and a really good route! Nice flat 5k repeat again to finish. Good medal and lots of great support! As it was also our club team championship it meant lots taking part and fantastic home support by the pink @craptri crew! Overall a top event for early season, even if like me you wish they'd chuck a swim in there too. Long Course Weekend is a unique festival of sport that offers an unbeatable atmosphere. Over three days athletes can choose events from three disciplines (swim, bike, run) and multiple distances to create a tailor-made weekend course for their ability. For those looking to push their limits, there's the Long Course option - the longest distance in each event. Each Long Course Athlete who finishes will receive the coveted fourth medal for their medal stack. Long Course Weekend events are world famous for their atmosphere and spectacular finish lines. Don't miss out, enter now! 3 Days. 3 Disciplines. 1 Weekend. The Swansea Triathlon course is simply in one of the best locations in the UK. With a calm, safe and spectator friendly swim, picturesque ride and a fast and flat run, this event will take some beating! The Wales Triathlon will take place in Fishguard, Pembrokeshire. Winner of the 220 triathlon awards for best triathlon, the weekend is ideal for new and experienced athletes alike. The Fishguard Sprint Triathlon will take place in Fishguard, Pembrokeshire with a fast course set in an incredible location. If you are looking for a race with an enclosed stunning sea swim; sea views, fantastic village support, topped off with one of the most breathtaking scenic runs on the circuit... read on!